Although accounts are sparse, there is good evidence to support a long history of gardening at Drummond castle - ever since the first Lord Drummond built on land granted to him in the late 15th century. The gardens supplied cherries for James IV in 1508 when he was hunting in the Glen Artney Forest. in the garden which is really very fine, with terraces, like an old French garden". The interest in Drummond Gardens continued into the 20th century despite changing gardening tastes. After the Second World War, with a reduced workforce, the decision was taken to simplify the garden. This bold step was taken by Phyllis Astor, wife of the 3rd Earl of Ancaster. A start was made to clear some of the ground, respecting significant features. 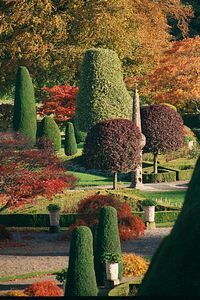 Amongst these were the ancient yew hedges at either end of the terracing and paths, magnificent individual yews and the two copper beech trees planted by Queen Victoria to commemorate her visit. 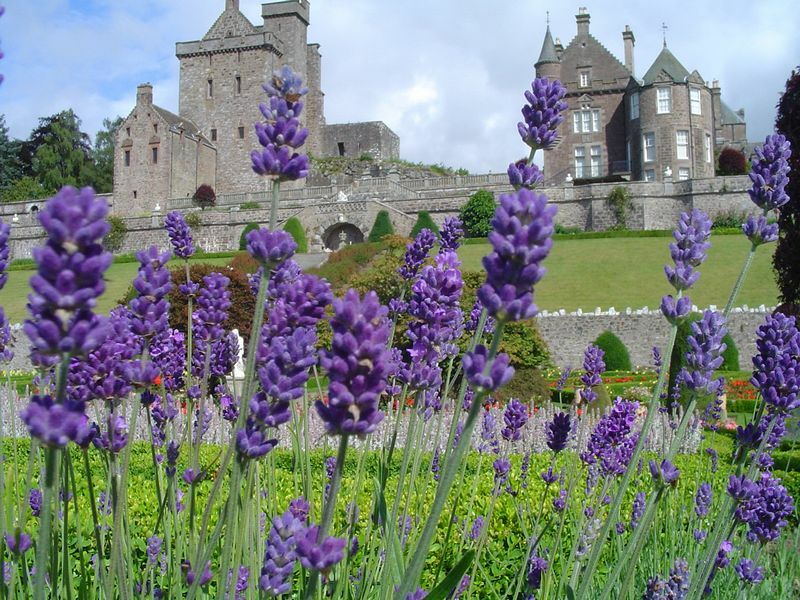 The gardens featured more recently in the United Artists film Rob Roy. From the east gateway on the Crieff Muthill road, visitors drive up the long beech avenue to the car park and then walk to the Castle. From the top of the terracing the full extent and majesty of the garden is suddenly revealed. 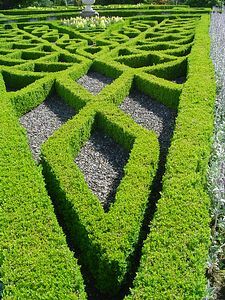 The dominant feature of the parterre design is a St Andrew's Cross with the multiplex 17th century sundial at its centre. A strong north-south axis runs through the garden, down the impressive flight of steps to the sundial, through the classical archway and kitchen garden beyond, cutting a swathe through woodland before rising to the top of the opposing hillside. This idea of drawing the countryside into the garden is essentially French; however, Drummond is an eclectic garden also rooted firmly in the Italian style with its fountains, terracing, urns and statuary. 2 miles south of Crieff on Muthill Road (A822), 20 minutes drive from A9. The track shown from the road is the main entrance, via the beech avenue, for cars. The road from Muthill, going West, North and then East around the Estate perimeter is the coach route. ( Coaches cannot get through the main gate).